Are you afraid of the dentist? Has your fear kept you from getting the dental care you need? If so, you’re not alone! An estimated 30-40 million Americans avoid going to the dentist because they’re paralyzed by anxiety. Some had a traumatic experience in their youth that they simply can’t shake. They actually have a type of post-traumatic stress disorder that can trigger a fight-or-flight response from simply stepping into a dental office. Other people simply feel vulnerable or distrustful, and find themselves anticipating pain even though they haven’t had a past negative experience. Thankfully there’s a solution to dental phobia. Keep reading as a sedation dentist in Kaukauna talks about how easy it can be to get the dental work you need and have the healthy smile you’ve always wanted. What Kind of Sedation Options Are There? There are two main types of sedation dentistry you can have: unconscious and conscious. Unconscious sedation is rarely used. Also known as general anesthesia or IV sedation, it’s the same thing you would have at the hospital prior to a major surgery. Oral Sedation – This refers to a medication that’s taken by mouth prior to your visit. One additional benefit of this option is that you will likely have no memory whatsoever of your dental work. With this type of sedation you’re required to have someone drive you to and from your appointment. 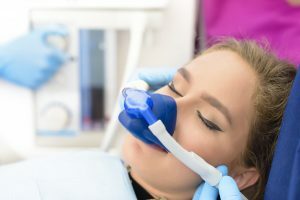 Nitrous Oxide – Also known as “laughing gas”, this is an odorless gas that you’ll breathe through a comfortable nosepiece during your treatment. While you’ll still get relief from your anxiety, you’ll be back to normal within a few minutes of being finished with your treatment, and can drive yourself home. Will Sedation Dentistry Really Alleviate Your Fear? The sedation options available today have enabled millions of people who were avoiding the dentist at all costs to feel safe, comfortable and secure in the dental chair. If you have more questions about whether you’re a good candidate, you can always schedule a consultation with a dentist in Kaukauna. Your dental health is extremely important. Good oral health means you can eat all of your favorite foods without a second thought. A healthy mouth also contributes to good overall health as well as increases your confidence, which positively affects every area of your life. Thankfully, in this day and age sedation dentistry is available and can free you from the crippling phobia that’s kept you from getting the dental care you need for so long. Drs. Bob and Heather Heil are a husband and wife team who are passionate about providing high-quality dental care in a comfortable setting. They have years of experience using sedation dentistry to help even the most fearful dental patients enjoy a lifetime of good dental health. If you would like more information they can be contacted via their website or at (920) 788-6280.